While it’s often possible to shoot closeup photos of insects such as dragonflies, it’s not always necessary or even the best approach. I spent an enjoyable time this afternoon along the edge of a pond seeking one of my favorite subjects: dragonflies! I had some very good luck and even got some very nice shots of a Slaty Skimmer — a big, indigo blue dragon I don’t believe I’ve captured before. 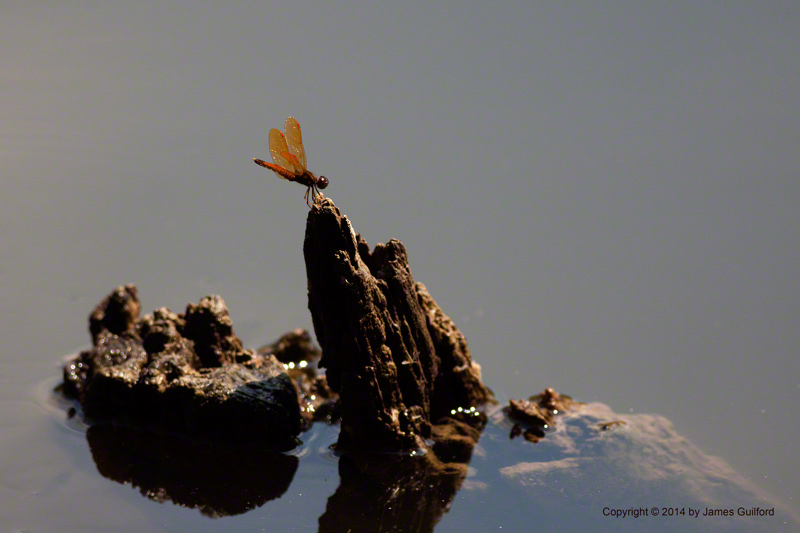 As I walked along beside the pond I looked out across the quiet waters and saw a tiny Eastern Amberwing perched on the top of a sunken tree trunk protruding from the surface. The weathered wood was dark and in silhouette, its form reflected on the water, but the little dragonfly glowed in sunlight. I shot image after image ’til finally the Amberwing flitted away. It wasn’t one of those highly-detailed, super-macro insect photos we often wonder at; I think I actually like it better. ‘Turns out, it was my favorite picture of the day! A closeup isn’t everything!